Two decades before the American Revolution, the Royal Province of New Jersey prepared itself for the culmination of seventy years of bickering between the French and the English colonists. The French armies and their Indian allies, intent on protecting their vast trading interests in the New World, advanced on the western frontier of the British domain. At Fort Duquesne, near modern Pittsburgh, the French flanked the British General Braddock, killing him and more than half of his men, setting off Indian raids throughout the Colonies. The Delaware, still enraged by the fraudulent Walking Purchase of their lands in 1737, and encouraged by their new advantage, threatened colonial settlements in New Jersey. During the French and Indian War that followed, New Jersey sent its provincial regiment, the "Jersey Blues," to battles at Oswego, Ticonderoga, and Lake George. At home, the government of New Jersey was forced to take measures to protect its northwestern frontier along the Delaware River from the increasing threat of marauding Indians. A line of forts and blockhouses were commissioned from Belvidere to Port Jervis, New York, with soldiers patrolling between them. 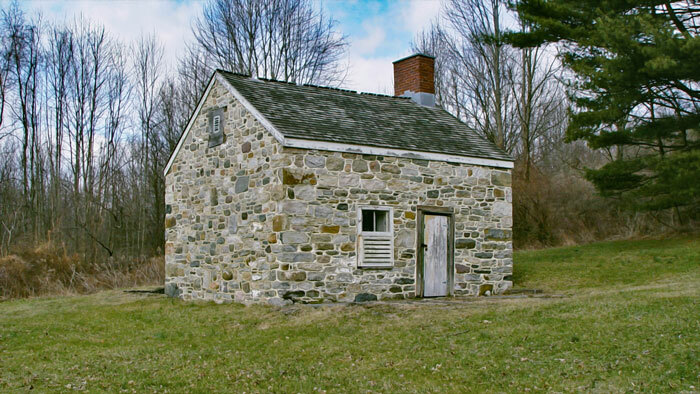 The stone house on the grounds of the Delaware River Family Campground, may have been part of Elison's Fort, designated by Hampton as "No. 1". By 1757 the Frontier Guards had taken the regular militia's place, maintaining patrols of six to eight men between the links in the chain of defense. Recruits were seasoned woodsmen over the age of twenty-one (regular militia began at sixteen), and came from all walks of life, including slaves and indentured servants. Members wore civilian attire—no two looked the same—and were required to equip themselves with musket, powder horn, hatchet, blanket and knapsack. The Frontier Guards were not "toy soldiers" and represented a fiercely self-reliant force, adaptable to the expanded challenges of an already hostile environment. After the seven years war, the group disbanded. Approximate locations of forts protecting the northwestern frontier along the Delaware River during the French and Indian War. See driving route below. By 1758, New Jersey's line of defense consisted of nine forts or blockhouses and four smaller "posts" running from the mouth of the Pequest River in Belvidere into the Neversink valley near Port Jervis, New York. A letter and map of Jonathan Hampton, quartermaster for the provincial government, provides much of what we know about the sites, which ranged from log cabins and simple blockhouses to stockaded or palisaded compounds. The forts were either built by the government or adapted from privately owned farmhouses, some fortified initially by the owners for their own protection. In 1779 Joseph Brant, a half-breed Indian feared for his treacherous raids on early settlers, wrote a letter to an associate which highlighted the necessity and effectiveness of the forts: "We have burned all the settlement called Minisink, we destroyed several small stockaded forts and took four scalps and three prisoners. the reason that we could not take more of them [settlers] was owing to the many forts about the place, into which they were always ready to run like ground-hogs." The first in the frontier line of defense was Fort Reading. No visible trace remains of this 1757 fort, which was located just east of the Belvidere-Riverton bridge in Warren County. Fifty soldiers could be garrisoned here within a sixty-foot square palisade surrounding a small stone house, and two blockhouses. A foundation that might have held one of the blockhouses was unearthed on this private property during a 1995 excavation. For a few years before Fort Reading was completed, the provincial government paid Robert Houey to have his Belvidere home fortified with a stockade that was manned by nearly two-dozen soldiers. Although long gone, this farmhouse was once located along Depue Street, south of the Pequest. Excerpt from Jonathan Hampton's letter regarding the forts along the upper Delaware River in New Jersey. 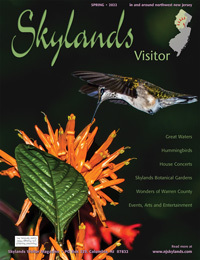 View more at the Delaware Water Gap NRA on-line exhibit. 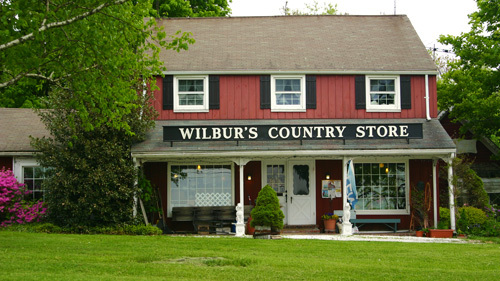 About three miles north of Belvidere, Route 46 passes the Delaware River Family Campground. A well-kept 24-by-35-foot stone house on the grounds is alleged to be Ellison's Fort, or "No. 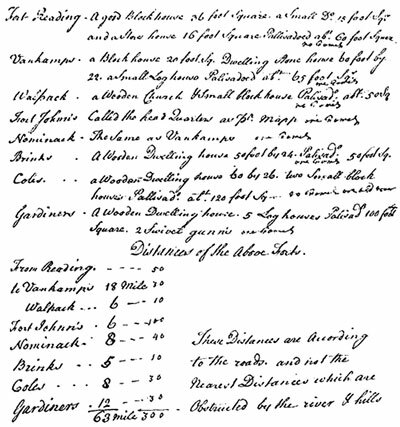 1" as it appears on Hampton's map. Originally, only the second story of this structure had windows, in the style of a blockhouse. Thirteen soldiers were garrisoned here. Hampton's map indicates an unnamed "New" Fort , somewhere in the area three miles north on Route 46, where the road crosses the Paulinskill River just before merging with I-80 West. Although its construction was authorized in 1758, there is no other evidence that it was ever actually built. After I-80 West weaves through the Water Gap, the exit for Flatbrookville (last exit in New Jersey) leads onto Old Mine Road. About nine miles north, the road passes the site of Colonel Abraham Van Campen farmhouse. Van Campen was one of the first and most prominent settlers of this part of the valley, and his property and fortified home was a natural anchor along the line of defense. Another fort was constructed just northeast of the house, described by Hampton as a palisaded complex containing a 22-by-60-foot stone house, a twenty-foot square blockhouse, and a small log house. Soldiers were almost certainly stationed here; a newspaper mentioned an incident when troops garrisoned here in 1756 crossed the river to fend off an Indian attack. An 1891 drawing of the site showed a ramshackle house, known to the family as "the old fort", said to have been partially constructed on the blockhouse foundation. By 1912 the structure had collapsed. In 1966 a portion of the fort's blockhouse foundation was excavated and by the 1970s only the corners were still visible. 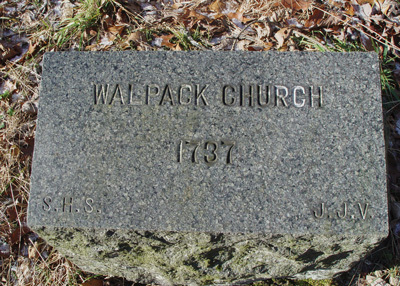 A monument marks the location of the Lower Dutch Walpack Church, later part of Fort Walpack. Old Mine Road continues for two-and-a-half miles through Millbrook, bearing left at the intersection there. A couple of miles later, at the bottom of a long grade, the road crosses the Big Flatbrook, just before an intersection in the former hamlet of Flatbrookville. Turn left, and the road bends sharply around a ridge on the right in the "Walpack Bend". Nearly a mile beyond the bridge the road passes the site of the Lower Dutch Walpack Church. An obscure low stone marker on the left, inscribed "Walpack Church 1737" is easily missed, and no trace of the ancient church remains. Hampton's map shows a fort designated "Walpack" within the Walpack Bend, describing it as a wooden church and small blockhouse within a fifty-foot square palisade. 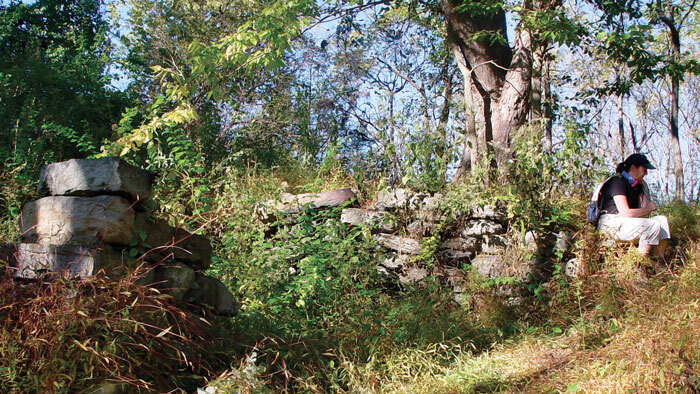 Although early local historians did not record any traditional site for this fort, it is believed the old church that once stood here had been the one referred to by Hampton, although a 1960s excavation focusing on a stone wall here could not confirm that it was once a part of Fort Walpack. Indian unrest and threats in this area were underlined by the death of William Ward, who was slain while hunting near the fort. And, in 1782, the commander of the fort and a party of men chased Indians on the Pennsylvania side of the river, although there is no mention of what their transgressions were. 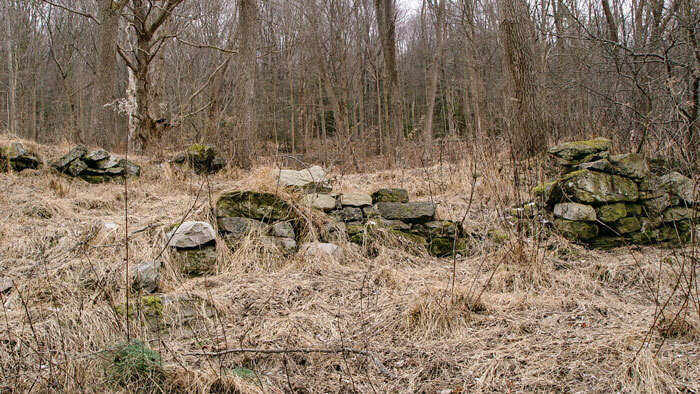 Alongside Old Mine Road, a short distance south of Van Campen's Inn, stone ruins of an old farm lie near the location of Adam Dingman's fort, "No. 2". Three miles beyond Fort Walpack, the road skirts the southeastern edge of a long, wide bottomland on the left, the probable location of Adam Dingman's 1735 farmhouse. By the time of the Indian threat in the 1750s, the house had been fortified and surrounded by palisades, and nine soldiers were stationed here. Although a large complex of farm ruins exist in this field, no definitive proof of the fort's exact location has come to light. Above: The stone ruins on the knoll above Van Campen's Inn are on or near the generally accepted site of Fort Johns. Below: The white area on the Inn's gable end marks a wall once common with an earlier structure, possibly part of the fort or an attendant structure. A mile farther, at the intersection with Pompey Road, Old Mine Road bears left, and is likely to be very rough and pot-holed. 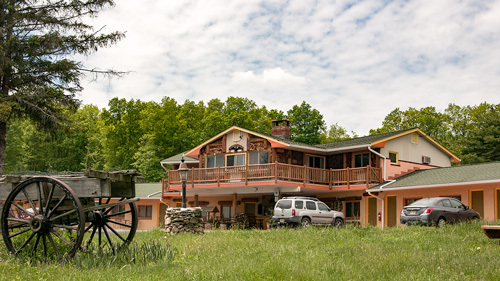 Two miles farther, along the Shapnack Flats, stands the impressive mid-1700s stone home of Isaac Van Campen on the right, commonly known as Van Campen's Inn. Fort Johns, or Headquarters, the frontier defense line's central and most impressive fort, was built in 1756. Local tradition claims that the fort, also known as "Fort Shapnack" was located on the knoll behind the Van Campen Inn. Fort Johns could garrison a hundred soldiers and served as the headquarters and supply distribution point for the Frontier Guards. Only a portion of the fort's old supply road, built across the mountains to Elizabethtown NJ, survives as the one-mile long Military Trail. Hampton described the fort as a 120-foot square palisade with fifteen-foot square bastions at three corners. A 24-by-50-foot blockhouse was incorporated as part of the palisade at the fourth corner. 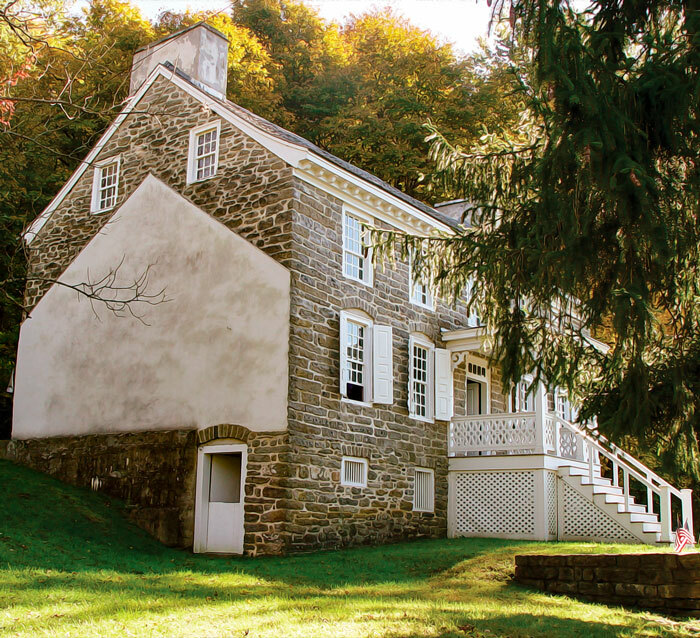 Within the palisades were a 52-by-26-foot stone dwelling and a 15-by-20-foot log cabin. The danger of Indian attack in the area was emphasized when Jacob VanKamp and Peter Brink were killed in an Indian attack near the fort in 1757. During the American Revolution the fort again saw service, used by the Patriot forces. 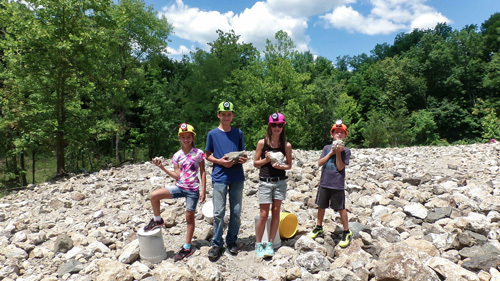 In another two-and-a-half miles Old Mine Road bears left, then intersects Walpack Road at a stop sign a mile later. 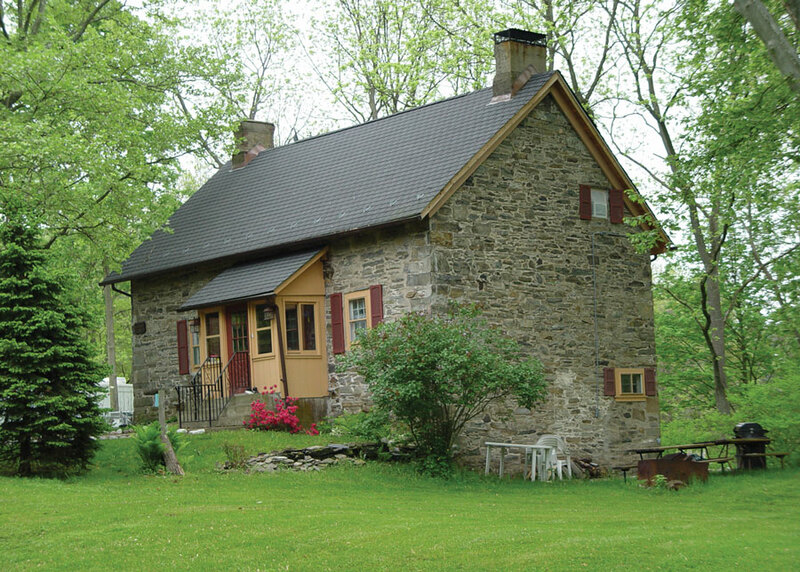 A small, beautifully restored stone house across Walpack Road served for years as the kitchen of the Bevans-Hellwig house. However, in earlier years it is believed to have been the blockhouse, probably privately owned, which Hampton called "No. 3 Carmer", capable of housing eight soldiers. Some historians believe this structure may not be the actual fort, but might have been built of stones taken from it. This small stone building is believed to be the ruins of Fort Carmer, or built from its stones. It later served as a kitchen for a larger house which is now gone. At Carmer's fort Old Mine Road takes a left turn, continuing nearly a mile to where it crosses Tuttles Corner / Dingmans Road, then proceeds northerly as CR-521 about four miles to Jager Road. Continuing for a few hundred feet, Old Mine Road skirts a large field on the left where, on a knoll a thousand feet or so from the river, is a scant rubble pile that may contain remains of the fort at Nominack. Fort Nominack was located somewhere out in this field along Old Mine Road just north of Jager Road. Hampton stated Nominack was "the same as Vankamps", indicating the fort may have included a blockhouse and stone dwelling enclosed within a stockade. Old records show that at least a log blockhouse had been built here during 1756 and garrisoned about forty soldiers. When Hampton visited this fort he was informed of earlier Indian attacks. The old fort's foundation may have survived as part of a stone building that had been constructed on top of it. But by the late 1970s the structure had fallen into ruin and was nearly eradicated by a "clearing operation" for the Tocks Island dam project. Though they were not mentioned by Hampton as part of New Jersey's official line of defense, two other early forts, t'schick-te-wacki and Fort Westbrook may have been located less than a mile farther on Old Mine Road, back near the river. One of these may have been a fortified Indian village called t'schick-te-wacki, an Indian name referring to "fine land". Visscher's 1652 map of Novae Belgii labels a site by that name near here, but the map is out of scale and somewhat inaccurate, making it difficult to determine exactly where he meant the site to be located. At least one nineteenth-century historian claimed a large Indian village was known to have existed near here and that it was stockaded. Some historians and archaeologists believe that if the fort existed, it may have been located near the edge of the Delaware River immediately across from the southern end of Minisink Island. Over the years, major Indian habitation and activity on this spot has been documented. Near the purported Indian fortress, according to local tradition, the Westbrook family had a fortified stone house just east of the southern end of Minisink Island, between the river and Old Mine Road near the Westbrook-Bell house. Although there are no known eighteenth century references to the fort, tradition holds that the structure was built around 1735 for defensive purposes, possibly due to Indian threats. If so, it is not known if this fort was palisaded. 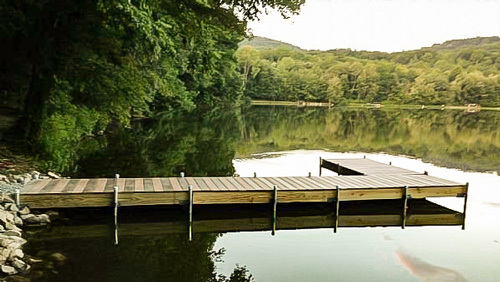 Hampering archaeological investigation, the structure was dismantled in the 1940s by a local landowner to be rebuilt a short distance away, closer to Minisink Island. About two miles farther, Old Mine Road (CR-521) crosses Rt. 206, then continues another mile to the vicinity of Block House Hill at or near Millville. Appropriately named, this hill may have been the site of another fort mentioned by Hampton. Various sources mention Shipeconk Fort, Mashipacong Fort, and Fort Brinks, quite possibly all making reference to the same fort. Mashipcong Fort, a traditional local name for a former fort located here, was not mentioned by Hampton, yet a 1940s road tour published by a local author claimed the fort was located in this area near an old roadside marker. She linked this fort to those of Hampton by stating it was "one of those built by New Jersey in 1755". Only scant conflicting references exist for the Shipeconk Fort. Although the fort does not appear on Hampton's maps, it is believed to have been built by 1757. State archives of 1763 refer to this fort but do not verify its location. Quite possibly, since "Mashipacong" and "Shipeconk" are phonetically quite similar, they are one and the same fort. Hampton referred to "Brinks", stating it was five miles from Nominack and could hold ten men. The fort consisted of Samuel Brink's 50Ðby-24-foot wooden dwelling house surrounded by a palisade. The location of the fort or its possible ruins has never been confirmed. A few hundred yards from the Shipeconk Fort was the fortified home of Capt. Abraham Shimer. The home was attacked by Indians during the unrest of the French and Indian War era. The defensive line of forts along the Delaware River ended at Cole's Fort in Port Jervis, eight miles above Brink's. Hampton described it as a 120-foot square palisade surrounding a 26-by-60-foot dwelling house and two small blockhouses. Other forts in the area and beyond were also utilized in defense of the ancient frontier including Gardner's, Fort Augusta, Becker's, VanAuken's, Westfall's, and others. For additional information and details on these early forts try the following sources: the National Park Service website (www.nps.gov); Jay C. Richards' excellently researched and detailed Flames Along the Delaware; and various books by Herbert Kraft. 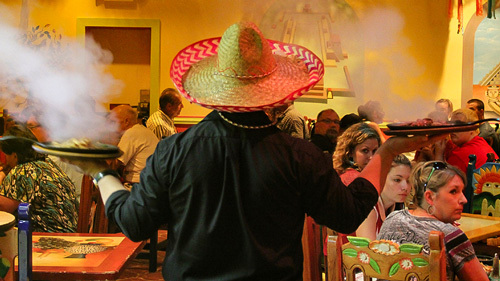 The author may be reached for comments or questions at rkop@earthlink.net.